DES MOINES, Iowa (AP) Bernhard Langer returned for a three-week break to shoot an 8-under 64 and take the first-round lead Friday in the PGA Tour Champions’ Principal Charity Classic. Langer closed the bogey-free round with a 12-foot birdie putt on the par-4 18th at Wakonda Club. The 60-year-old German star took the brief break in part to attend his son’s high school graduation. On Friday, he had four birdies in a six-hole stretch on his final nine. Austin, in search of his fourth senior win, shot a 31 on the front nine. Jobe struggled so much during the pro-am Thursday that he spent an extra two hours hitting balls in an effort to correct his swing. ”It was worth it. I needed to,” Jobe said. 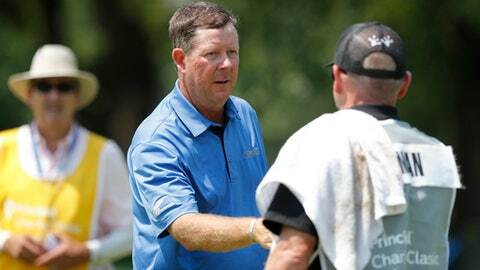 Mark Calcavecchia, the 2016 winner, withdrew after two holes for what tour spokesman Chris Richards said were family reasons.